I didn't find too much in the way of mutated gummis (we'll see them in a later picture), but I did notice this little fella. He stuck out like a sore thumb, all lime green while all his compatriots were dark green. I nicknamed him "Powder", after the film character of the same name, since he appeared to be an albino gummi. He failed to exhibit any telekinetic powers like his namesake, unfortunately. Powder just sort of kept looking at me the whole time I was sorting gummis, and I started to find myself growing attached to the little guy. Still, I vowed there would be no mercy from the fires of the melting pot. Just about 20 minutes later, I finished sorting the gummis, ending up with a wonderfully color-coordinated counter full of candy, and hands that appeared to be covered in a buttered cooking spray. One hand-washing later, we're ready to move on. 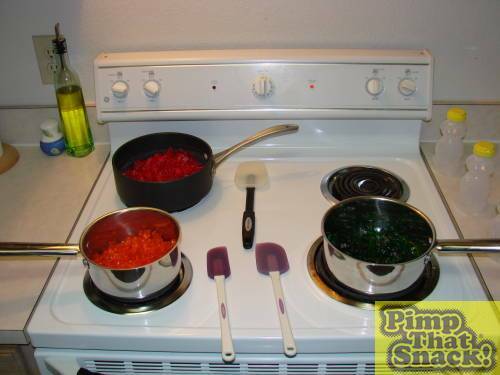 As you can see, I mobilized every spatula I own, unwilling to cross-contaminate the pristine perfection of each gummi color. I let everything melt slowly on a very low heat setting. 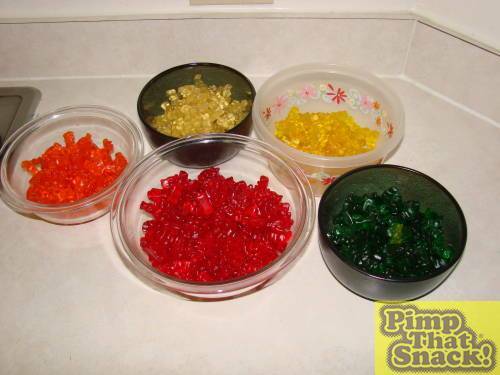 Not only did that give me time to prepare the honey bears, but it also gave me a sick sort of pleasure as I watched individual gummis slowly die in the gummi magma. 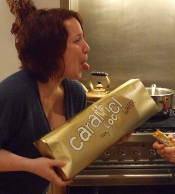 A tip, if you're going to try this at home�stick with stainless steel. The black saucepan on the right rear burner didn't seem to want to melt the gummis as well, and it took more than twice as long as the others. Onto the honey bear preparation. The first time I tried this, I just dumped the gummi magma into the honey bear. It looked great, tasted even better, but took about 10 minutes to get the thing out of the mold. As we'll see later, melted gummis are the stickiest form of matter in the universe. I've even started using gummi magma to hang artwork around the house. So, to combat that problem, I figured I'd try a lubricant of some sort. 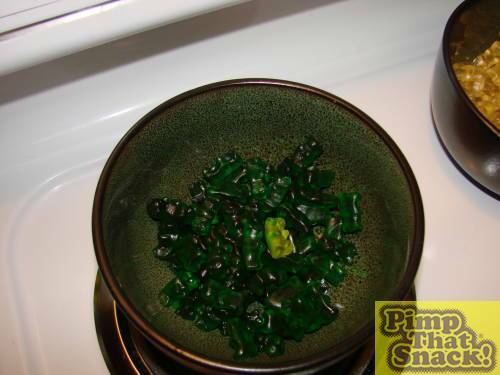 Since my hands appeared to be covered in oil after sorting the gummis, I figured oil would keep them from sticking. So, a few drops of vegetable oil, and a few shakes later, the honey bears were stick-proofed. 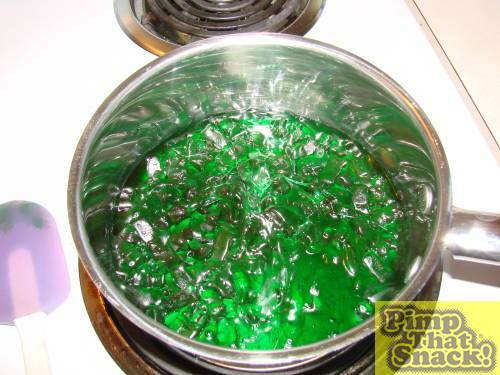 Meanwhile, the melting process continued, and you can see that it starts out as sort of a runny gummi snot of sorts. I imagined at this point that I could hear their little gummi screams, but that didn't deter me from my mission. They don't require any stirring, or really any attention at all. They melt nicely into a uniform goo, and in fact, stirring can be quite a hassle as the magma sort of encases anything it touches with a Blob-like ravening. 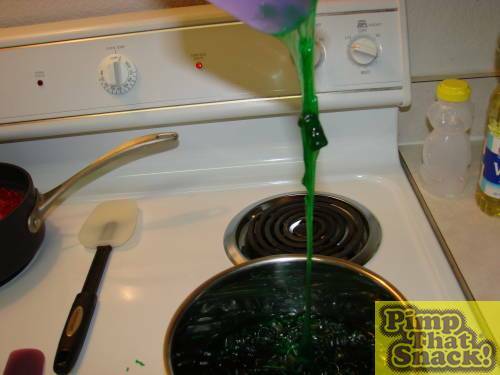 I made the rookie mistake of trying to stir the greens halfway through the process. As you can see, my spatula barely made it out alive. It's interesting to note the gummi attempting a prison-break up through the tractor beam of magma. He was quickly returned to the pot of death, but I do give him my admiration for the attempt.